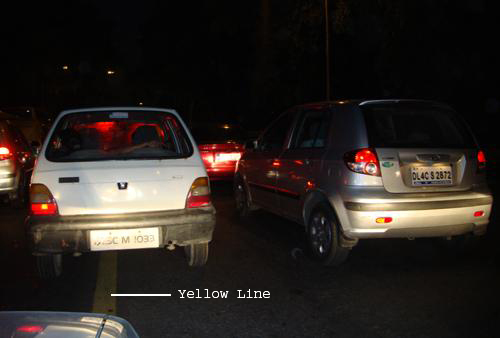 Traffic rules are no exception. There is a rule book that the Delhi Traffic Police has and one traffic policeman was generous enough to hand me a copy, for free! These are universal traffic rules and signage for motorized traffic all over the world. There is a reason for that. But we do not follow traffic rules. We rarely cross at the zebra crossing. We stop to buy chaat from the street vendor on the roadside creating traffic block. There is always a car coming from the opposite direction while taking a U-turn under a fly over. There is always one vehicle coming at full speed in the wrong direction at any given left turn. We always overtake from the left. We rarely wait for the pedestrian to complete crossing. Rarely do we wait for the traffic light to turn green before we take off. Rarely do we let someone else overtake us. Rarely do we wait for a vehicle at a cross road to let into the traffic before us. We love to break small rules and when caught we would rather pay-up the traffic cop than pay the fine. We begin early in school and carry it out in our every day lives. All this adds on. Having better roads and more vehicles in a city is not enough to improve traffic flow in the city. Along with it, we need disciplined traffic that follows rules so that speed and efficiency of traffic can be increased. The first step in improving traffic in our city is to accept that we do not follow rules. We should take full responsibility to the chaos we have on our streets. Without this we cannot even begin to transform our traffic system. As Carl Jung the famous psychologist once said, ‘The most terrifying thing is to accept oneself completely’. Having lived in a country with one of the strictest driving test standards globally, I think one of the prime causes for unruly traffic in India is the utter ease with which driving licenses are obtained. The convenient practice of a few days behind the steering, one sloppy “test” with a cop in the car is enough to fetch us the right to be on the roads with a four wheeler. Some luckier ones manage to obtain their driving license even when they are physically away from the city issuing it! In UK, at least 80-100 hours of driving practice is mandatory for a new driver even before becoming eligible for a driving test. During the test, one major mistake (such as not stopping at a zebra if a pedestrian is waiting to cross; not giving way to right hand traffic at a roundabout) is enough to fail. Significant financial implications are associated with each hour of driving lessons, each test taken and each failure in tests. In Switzerland, if a candidate fails the driving test twice, s/he is referred to a counsellor, failure thrice is declared unfit for driving. Hitlarian as these may sound, such rules are successful in reducing risky behaviour among drivers. Incidents of public buses meeting with accidents or running down people are extremely rare, if not nearly absent , annually. It is enforced at each step that drivers have greater responsibility towards safety than pedestrians. A population of 1.6 billion is difficult to be disciplined with bookish rules. Enforcement of rules need to take place with a holistic approach. As disaster management becomes the new mantra in India, traffic safety needs to be seriously encompassed within its ambit alongside more spectacular ‘disaster’ events.